In our last post, we began the journey of discovering extended family by searching for Arthur (Atall, Arthol, Athol) Blake and his wife on the 1900 through the 1920 Censuses. We left you with the challenge of finding them on the 1930 and 1940 Censuses. If you are the first to find this family on the census, let us know so that we can acknowledge your success! We will continue to look for Blake descendants and suggest resources that you can use to narrow down those in your own family who may still be living. We also discovered a sister of Arthur (Catherine Wilson) who was a widow in 1910 and a niece, (Silome Wilson b. 1910). We needed a break after all the census research challenges, so we searched South Carolina, Death Records, 1821-1961 for Arthur Blake using the various spellings for his name. We were hoping to find information that would lead us to the discovery of more descendants. 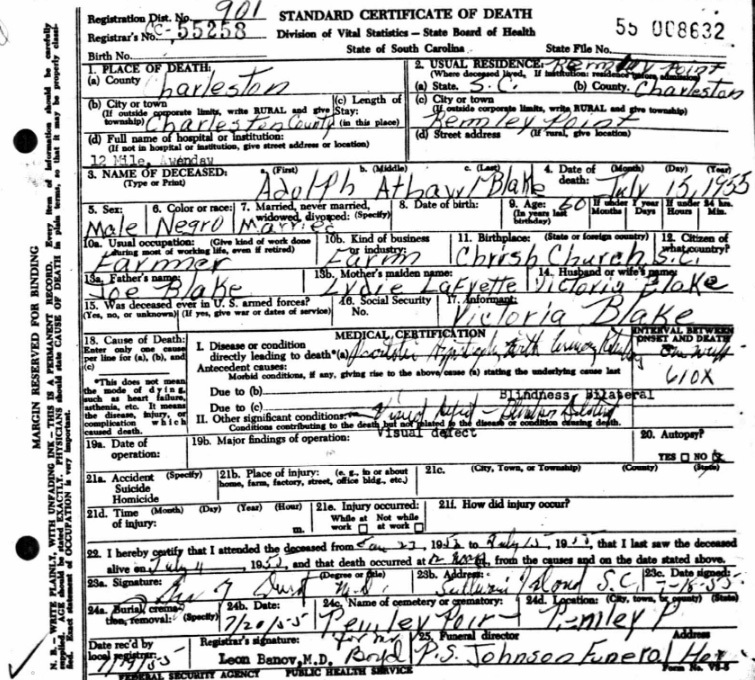 Death Certificate of Adolph Athawr Blake, 1955. Ancestry.com. South Carolina, Death Records, 1821-1961 [database on-line]. Provo, UT, USA: Ancestry.com Operations Inc, 2008. Charles and James were the only two children of Victoria and Arthur Blake that we know the surnames for. We discovered a Charles Blake with wife Ethel on the 1930 and 1940 Censuses and in the Charleston City Directories, but they had no adult children as of 1940. Now that we know the parents of Arthur Blake, we could search for siblings and discover their descendants. Joseph and Liddia Blake Household, 1870 Census. “United States Census, 1870,” database with images, FamilySearch (https://familysearch.org/pal:/MM9.3.1/TH-267-11836-72337-75?cc=1438024 : accessed 5 March 2016), South Carolina &gt; Charleston &gt; Christ Church &gt; image 69 of 114; citing NARA microfilm publication M593 (Washington, D.C.: National Archives and Records Administration, n.d.). We searched for death certificates for each sibling. Stephen was the only sibling of Arthur that we could find with his parents documented on the death certificate. The descendants of Stephen and Monday are relatively easy to trace using the census. Stephen lived until March 7, 1948 when he passed in Mount Pleasant, South Carolina. We could also research Monday Blake on each census from 1900 to 1940 to add more Blake descendants to the list. It looks like finding living Blake family members is easier if we began with the children of Stephen or Monday. The next step would be to research each of the children of Stephen forward using the census (Stephen Jr, Madeline, Georgiana, Benjamin Stacky, Carrie Stacky). Who is Not Among the Living? By the time you research each child that you can to 1940, you will have a good idea whether family members migrated before 1940. If they stayed in Mount Pleasant, your next step would be to search for a death certificate for each descendant or look for them on the Social Security Death Index. If you have access to an obituary index, search for each descendant. Obituaries are very useful when it comes to searching for extended family because they often name surviving family members. Using obituaries, we have discovered the surnames of the females we were not able to trace after they married. City directories and funeral programs can also be very helpful in determining death dates. Someone who disappears from a directory after being listed for consecutive years may have passed away or moved. Funeral programs mention surviving and deceased family members. Check the local church membership. Send a family tree to the church secretary who can assist you in contacting members who are related to you or can share history about your family with you. Attend church homecomings where people from all over the country return to celebrate their heritage. Create a family Facebook Group so that your extended family can find you. Share what you have discovered about your ancestry. Share your photos. Facebook has become a popular way for cousins to discover each other. Invite your family, and ask them to share what they know. Share your DNA results at GedMatch.com and other places with a significant number of participants where you may connect to people who are related to you. Compare genealogies to determine how you are related. Choose a sibling or cousin of your ancestor from an early census that you have not researched before. Trace that person forward to 1940 making a list of each descendant that you find. Use the resources outlined above to determine who is no longer alive. Use the suggested resources above that document living people to determine if any descendants are still alive. Come back to this post in our Facebook research group, and let us know how this process worked for you.